Here is your weekly reminder that this blog is only a few of my wandering thoughts from the game. If you would like a full recap, head to BostonLaxNet for a game story, highlights, and a sidebar on coach Ryan Liebel's perfect first season. That last story features video postgame interviews with Liebel, along with players Keegan Dudeck and Drew Kelleher. 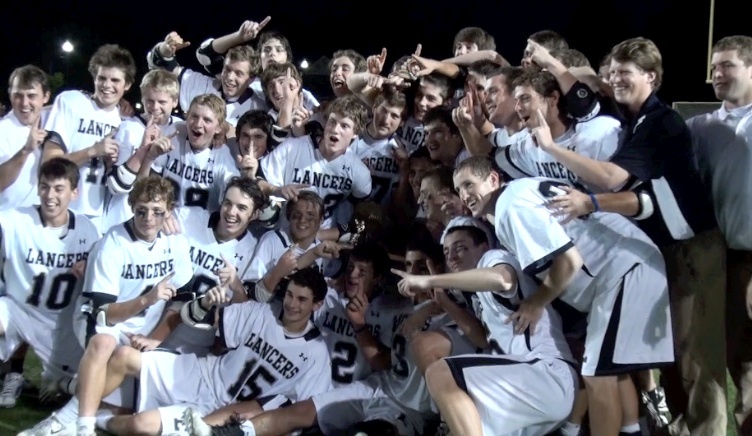 During Longmeadow's perfect season, no win turned heads like their 16-1 beat down of perennial D2 power Medfield. Now, faced with another test against Medfield, the Lancers knew to expect a totally different ball game. Medfield jumped on Longmeadow early, scoring first, and holding three different leads in the first half. Junior middie Thomas Sears was particularly effective early, scoring a pair of goals in the game's first 16 minutes. Medfield's start was great and all, but Keegan Dudeck put the Lancers on his back offensively. The senior went out in style, scoring five goals, and all of them seemed like crucial ones. Three times in the first half Dudeck tied the game up moments after Medfield seized the lead and temporary momentum. But, his last two goals were easily the game's biggest. With the game tied at six in the fourth quarter, Dudeck beat his man right, and fired home a goal just before the help could arrive. Moments later, he scooped up a ground ball and barely fit a shot in the upper-right corner to give Longmeadow some breathing room. After the game Dudeck thanked his teammates, but this was one heck of an individual effort. After all, every single one of his goals was unassisted. After a perfect 25-0 season and first state title since 2008, first-year coach Ryan Liebel has Longmeadow positioned to be the Western Mass, and perhaps state D2, favorite for the foreseeable future. The team loses only four seniors (Dudeck, Eric Barsalou, Noah Gurzenski and Kevin Barry), and returns one of the best middies in the state in Drew Kelleher, along with sensational goalie Matt Draymore. Add in Zach Lukas on attack, and that's a heck of a senior class to build around for next year, but this team also has rising junior Matthew DeMarche and soon-to-be sophomores Wiliam Lukas and Maxwell Stukalin to look forward to. I think it's safe to say that the Lancers are well stocked with talent for the next few years.